Mineral oils are the petroleum-based oils that are the most commonly used hydraulic fluids. Basically, they possess most of the desirable characteristics: they are easily available and are economical. In addition, they offer the best lubrication ability, least corrosion problems and are compatible with most seal materials. The only major disadvantage of these fluids is their flammability. They pose fire hazards, mainly from the leakages, in high-temperature environments such as steel industries, etc. Mineral oils are good for operating temperatures below 50°C, At higher temperatures, these oils lose their chemical stability and form acids, varnishes, etc. All these lead to the loss of lubrication characteristics, increased wear and tear, corrosion and related problems. Fortunately, additives are available that improve chemical stability, reduce oxidation, foam formation and other problems. 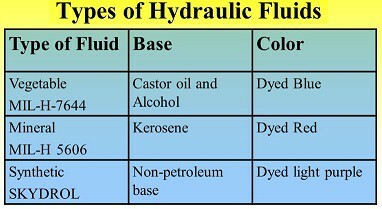 A petroleum oil is still by far the most highly used base for hydraulic fluids. Most of the desirable properties of the fluid, if not already present in the crude oil, can be incorporated through refining or adding additives. A principal disadvantage of petroleum oil is that it burns easily. For applications where fire could be a hazard, such as heat treating, hydroelectric welding, die casting, forging and many others, there are several types of fire-resistant fluids available. Emulsions are a mixture of two fluids that do not chemically react with others. Emulsions of petroleum-based oil and water are commonly used. An emulsifier is normally added to the emulsion, which keeps liquid as small droplets and remains suspended in the other liquid. hence, it exhibits the characteristics of water. Its limitations are poor viscosity, leading to leakage problems, loss in volumetric efficiency and poor lubrication properties. These problems can be overcome to a greater extent by using certain additives. Such emulsions are used in high displacement, low-speed pumps (such as in mining applications). Water-in-oil emulsions, also called inverse emulsions, are basically oil based in which small droplets of water are dispersed throughout the oil phase. They are most popular fire-resistant hydraulic fluids. They exhibit more of an oil-like characteristic; hence, they have good viscosity and lubrication properties. The commonly used emulsion has a dilution of 60% oil and 40% water. These emulsions are good for operations at 25°C, as at a higher temperature, water evaporates and leads to the loss of fire-resistant properties. Water glycol is another nonflammable fluid commonly used in aircraft hydraulic systems. It generally has a low lubrication ability as compared to mineral oils and is not suitable for high-temperature applications. It has water and glycol in the ratio of 1:1. Because of its aqueous nature and presence of air, it is prone to oxidation and related problems. It needs to be added with oxidation inhibitors. Enough care is essential in using this fluid as it is toxic and corrosive toward certain metals such as zinc, magnesium and aluminum. Again, it is not suitable for high-temperature operations as the water may evaporate. However, it is very good for low-temperature applications as it possesses high antifreeze characteristics. Synthetic fluid, based on phosphate ester, is another popular fire-resistant fluid. It is suitable for high-temperature applications, since it exhibits good viscosity and lubrication characteristics. It is not suitable for low-temperature applications. It is not compatible with common sealing materials such as nitrile. Basically being expensive, it requires expensive sealing materials (viton). In addition, phosphate ester is not an environmental-friendly fluid. It also attacks aluminum and paints. The increase in the global pollution has led to the use of more environmental-friendly fluids. Vegetable-based oils are biodegradable and are environmental safe. They have good lubrication properties, moderate viscosity and are less expensive. They can be formulated to have good fire resistance characteristics with certain additives. Vegetable oils have a tendency to easily oxidize and absorb moisture. The acidity, sludge formation and corrosion problems are more severe in vegetable oils than in mineral oils. Hence, vegetable oils need good inhibitors to minimize oxidation problems. As more and more organizations are understanding their social responsibility and are turning toward eco-friendly machinery and work regime, a biodegradable hydraulic fluid is too becoming a sought after product in the dawn of an environmentalist era. Biodegradable hydraulic fluids, alternatively known as bio-based hydraulic fluids, Bio-based hydraulic fluids use sunflower, rapeseed, soybean, etc., as the base oil and hence cause less pollution in the case of oil leaks or hydraulic hose failures. These fluids carry similar properties as that of a mineral oil–based anti-wear hydraulic fluid, Hypothetically, if a company plans to introduce bio-based fluids into the hydraulic components of the machinery and the permissible operating pressure of hydraulic components is reduced to 80%, then it would inversely lead to a 20% reduction in breaking-out force owing to the 20% reduction in excavator’s operating pressure. It is so because a reduction in the operating pressure of a system leads to a reduction in actuator force. Besides, the transformation would not only include the cost of fluid and flushing of machinery to transcend from a mineral oil to vegetable oil repeatedly but also include the derating costs of machinery. 1. Operating pressure of the system. 2. Operating temperature of the system and its variation. 3. Material of the system and its compatibility with oil used. 5. Availability of replacement fluid. 6. Cost of transmission lines.